Three soldiers and a militant were killed in a firefight today near the Line of Control (LoC) in north Kashmir’s frontier Kupwara district. The Army said it had neutralised an attempt by a group of militants to infiltrate into the Kashmir valley. The Army said four of its soldiers who were part of a forward battalion sustained injuries in the gunfight in the remote Tangdhar sector of Kupwara district. Of them, three succumbed to their injuries. The fourth injured soldier is out of danger, the Army said in a statement here. The identities of the slain soldiers could not be immediately confirmed. It was one of the most deadliest firefights along the LoC in north Kashmir in recent months. The firefight started when an Army patrol led by a Junior Commissioner Officer (JCO) intercepted an infiltrating group of militants in the northern part of the Tangdhar sector, Army sources said. In the ensuing exchange of gunfire, the Army said it succeeded in pushing the militants back across the LoC while the body of one militant was recovered from the site of the encounter. One AK-47 assault rifle, one pistol and “other administrative items” have also been recovered from the site, the Army said. Indian Navy Chief Admiral RK Dhowan today released the infrastructure development plan for the next decade for the Navy that includes massive plan laying down the way forward for the existing ports at Karwar located south of Goa and Port Blair in Andaman and Nicobar islands, which stand close to the sensitive shipping lanes. The Admiral was speaking at the start of the four-day Naval Commander's Conference here today. The Navy's plan will include additional infrastructure in all-forward operating bases, have new Naval air enclaves, keeping in mind the expansion in the Navy in terms of new ships, submarine, helicopters and fixed wing planes. During the inaugural session, Admiral Dhowan took stock of various operational activities conducted during the last six months including exercises and rescue operations, like the one in Yemen. Top Navy commanders will review critical operational issues during the conference. The Navy commanders will discuss operational relevance, identify capability gaps and review future plans. The focus is on creating operational, technical and administrative infrastructure and address issues concerning induction of manpower, training and skill development and welfare of personnel. The commanders would discuss operational readiness of commands, coastal security and ways to strengthen cyber security. Three persons, including a soldier, telecom employee and a militant, were killed in two militant attacks in the Kashmir valley on Monday. Militants ambushed an Army patrol in Kulgam district of south Kashmir in which a soldier and a militant died. In another attack, the militants carried out shooting in a telecom company outlet in north Kashmir’s Sopore town in which an employee of the BSNL was killed. The militants ambushed the army patrol in Kangikular village of Kulgam, triggering a brief firefight in which one soldier was injured. Soon after the shooting, the security forces cordoned off the village and launched a search operation during which contact was established with a fleeing militant in a nearby orchard, police and army officials said. During the subsequent gunfight, the militant was killed, officials said. The militant has been identified as Ayatullah Bhat, a local commander of Lashkar-e-Toiba who was involved in a series of attacks. An Army spokesman said one AK-47 rifle has been recovered from the gunfight site. The injured soldier identified, whose identity was not immediately confirmed, also succumbed to his injuries at a hospital. In an earlier attack during the day, an employee of Iqra Telecom, the franchise of BSNL telecom company in Sopore town, 50 km from here, was killed when militants fired at the outlet before escaping from the scene, senior police officials said. The victim Mohammad Rafiq of Handwara, who was hit by a bullet in the back, succumbed to his injuries at a hospital. Two other employees at the outlet were also injured in the attack, which the police suspect was carried out by Hizbul Mujahideen militants. Security forces rushed to the scene of the attack and combed the market but could not establish contact with the militants. The attack targeting the BSNL outlet comes amid heightened tension in Sopore as militants had told telecom companies to shut their services in the north Kashmir town, which has been a stronghold of separatists. Police suspect the warnings issued by militants this month and today’s attack are linked. Earlier on Saturday night, militants had hurled two grenades targeting cellular towers in Sopore town. On May 1, militants had raided the offices of several telecom companies in Sopore town and claimed that a device which they had fitted to a mobile phone tower had gone missing and demanded it back immediately. Police sources said the device had been identified and recovered. “The device was used by militants for their wireless communication and initial investigation suggested it belonged to Hizbul Mujahideen,” a source said. The imminent attachment of properties of the Ministry of Defence (MoD) and salaries of the ministry’s functionaries have apparently spurred the MoD to implement the long-pending orders passed by the Armed Forces Tribunal in a large number of cases. The implementation orders in about 250 cases were placed before the Chandigarh Bench of the Tribunal today in petitions pending for non-execution of its judgments, some of which date back to 4 years. All judgments pertained to grant of benefits to disabled and war-disabled soldiers. While passing such strong orders for the first time in a bunch of execution petitions last month, a bench headed by Justice SS Thakur made it clear that the Tribunal would be taking coercive action and invoking the powers of execution under Order 21 of the Code of Civil Procedure (CPC) to get those orders executed which had not been implemented by the MoD. Last year, the Punjab and Haryana High Court had, in an order passed in a public interest litigation titled Maj Navdeep Singh versus Union of India, made it clear that the AFT could invoke provisions of Order 21 of the CPC to get its orders implemented. Order 21 provides for both detention and attachment of property of judgment debtors. It was brought to the notice of the High Court that “keeping the implementation of judicial orders in suspended animation was an affront to the majesty of law which the Tribunal was duty-bound to protect and was also against the grain of judicial dignity”. 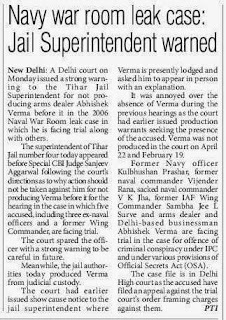 Many ex-servicemen organisations as well as legal practitioners had repeatedly complained to the Defence Ministry in the recent past regarding the contemptuous behaviour of the MoD in not showing due regard to orders of the AFT and for not implementing the same. More than 70 per cent cases pending before the Chandigarh Bench pertain to non-execution of orders, lawyers said. 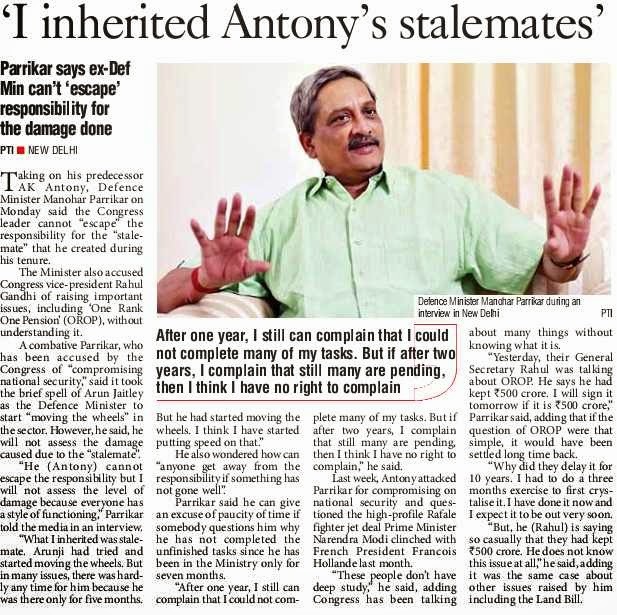 Defence Minister Manohar Parrikar spoke on a range of issues to Dinakar Peri and Amit Baruah of The Hindu during an exclusive interview at his South Block office on Monday evening. I think you have a website video — I think courtesy Aaj Tak — that shows the full five-minute clip. I don’t have to say anything on the issue. The Pakistani Defence Minister has reacted to your comments, and his claim is that these show India is fomenting terror in Pakistan. How do you react to that? You listen to what I have said and in what context. If you see the context, the question was on 39 terror camps in Pakistan. So I don’t have to answer any further on the issue. I am the Defence Minister of India, and my concern is about the defence of India. So beyond that, I don’t think it deserves any further clarification or information. We see all other countries engaging with the Pakistani Army Chief directly. The previous regime had invited him here. Do you think that India needs to engage directly with the Pakistani Army? Exactly what I am trying to point out. You are getting me into the field of [External Affairs Minister] Sushmaji [Swaraj]. You should go to Sushmaji with this question. My job is to create an environment where my security forces are prepared all the time, and you will find them prepared. When an emergency requirement was there, we managed to help our neighbours, we got water to Male, we got our ships in Yemen from where not only Indian nationals but also other nationals, including Pakistanis, were rescued by us. We didn’t say that they are Pakistanis because it was a humanitarian issue. But we were the only country which could do that. We went to Nepal quickly [after the earthquake]. So wherever we are on call, we have reacted immediately. 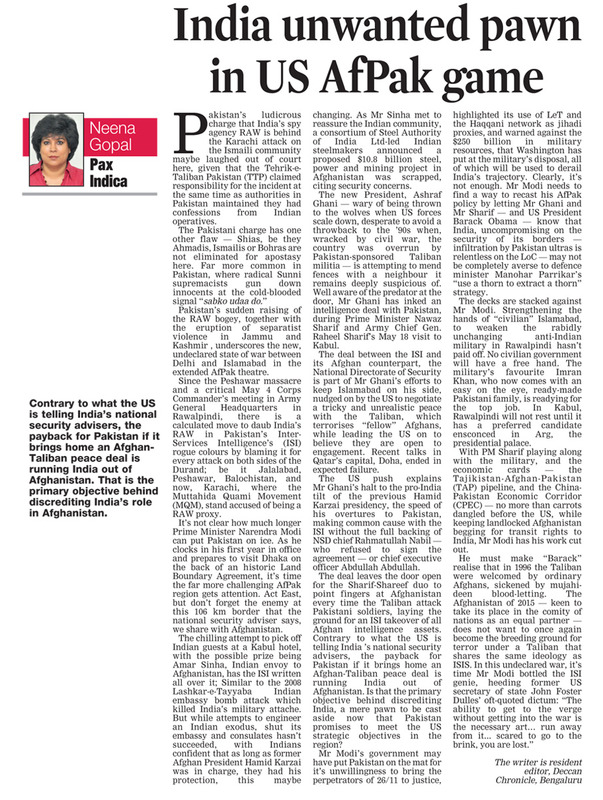 Today, the Defence Ministry’s role is not used for diplomatic or soft targets. Soft methodology is normally used in political or diplomatic channels. 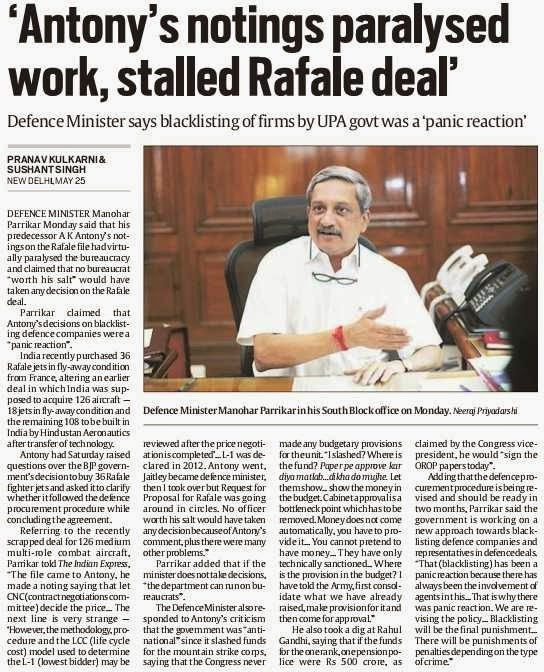 The Defence Ministry is the hard way. So we have to strengthen our forces. Strengthen it to a level that anyone should think twice before considering any misadventure. My preparation I am confident of what we are doing. We are building up our strength. Again I am very clear. My strength is based on my national interests and it is [a] defensive posture. But even in [a] defensive posture, if your strength is adequate and that adequate strength is expressed, I don’t see any reason there should be any talk about threat. The Kargil review committee had recommended the appointment of a Chief of Defence Staff (CDS). What is the government’s current thinking? I will take a call on it, maybe in July or so. But to be frank, it is not my decision. The decision has to be of the Cabinet Committee on Security, and the call has to be taken by a security committee. So I will put up my proposal, maybe in July, for consultation, let it be discussed by various people who are concerned and then we will come to a conclusion. I believe that there should be a body which will see the integration of forces. The current arrangement is inadequate, according to me. So in your view, a CDS could be required? The name itself doesn’t have much meaning. What is important is whether the person has the appropriate authority to integrate the forces and to whom his responsibility lies and to what extent. I will give a very simple example. For any Army to proceed, you require cover by the Air Force or sometimes, even the Navy. 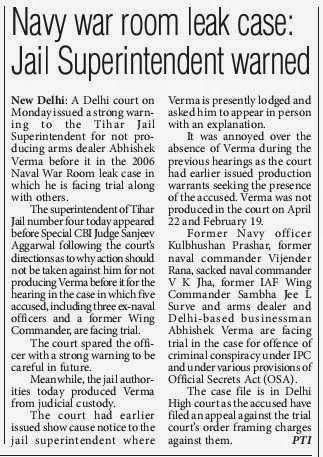 So when the Kargil war was being fought, the Air Force was giving cover to the Army. This has to be synchronised. Now this synchrony includes acquisition of capital assets. Unnecessary duplication of assets should not be there. All these aspects the CDS can take care. Are you happy with the way the Rafale deal has turned out for India? That is the only solution. In fact, only [Prime Minister Narendra] Modi could have taken this kind of decision. [When it comes to] Prime Ministers in the past many years, probably Atalji [Bihari Vajpayee] showed some decision-making ability. However, I would like to add that the decision is not complete. The decision is only to acquire 36 [aircraft] at better terms. I was watching the Congress press conference, I was surprised they are not aware of exactly what had happened. They probably didn’t even take the required trouble of getting more information. 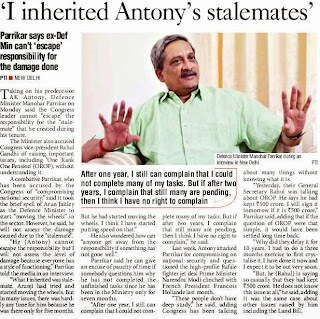 Actually, [Congress leader and former Defence Ministry A.K.] 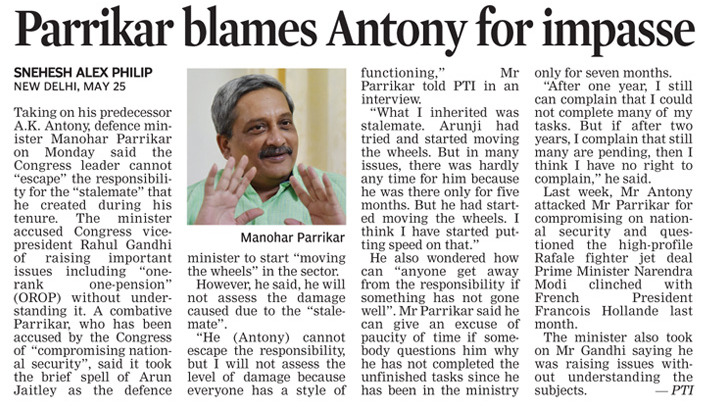 Antony should have got it because he knows so many in the Defence Ministry. The decision is a joint statement at this moment. The rest is being discussed. 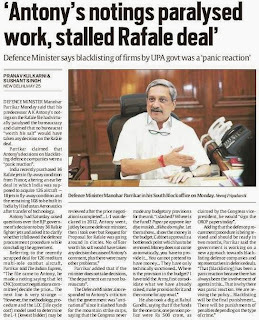 Is there an element of technology transfer involved in the government-to-government Rafale deal agreed to by the Modi government? I will not talk about it until all talks are complete. Then we will come very clear, transparently. You don’t discuss issues when they are under negotiation and consideration. It will be foolish. It’s just like you don’t discuss publically what is in the court if you a party. Third person can always do it. I can’t do it because I am a party to it, my ministry is a party to it. Let them have the talks, let them come out with some conclusion… It can assure you it will be so transparent you will not have to ask again. Are you satisfied with the situation on the Line of Actual Control with China? The day I am satisfied, you will not ask me this question. And how would you describe the situation? Do you think with Prime Minister’s visit to China have things improved? I can say it was better than it was earlier. Prime Minister’s visit abroad has improved things a lot in defence. It has actually strengthened India’s position in defence to a level where I think what could not have been achieved over many years has been achieved in one year. Do you see China as a competitor, rival or enemy? I will always consider it a healthy competitor for growth in economic activity, and I would like to repeat China’s success story in manufacturing. In terms of our defence issues with the Chinese, how would you rate that issue? Slowly, over time, I think issues will cool down and get resolved. But if someone expects overnight resolution, that may not possible. What is simmering for the past 66-67 years cannot be expected to be solved overnight. Now there is a strong government in Delhi, and after 30 years, you have one with a full majority. Do you think this is the time for the two governments to take bold decisions to resolve the boundary issue? Many bold initiatives are being taken. In fact, the very progressive nation-building steps which Modi is taking have the opponents worried. Their attitude to stop the government is not because they are convinced about irrationality or illogical steps being taken. But the steps being taken by the government is going to actually make the nation grow. They are worried on that. Because if that happens, they are history. Otherwise, the Congress can’t speak on the issue of land acquisition. The biggest scams between 2009 and 2012 are by the Congress in land acquisition for special economic zones. Yes, I agree with you. You bring it in an election year and ask for support. See here, a lot of political natak [drama] happens. The best thing I like about this Prime Minister is his clear thinking, he has long-term thinking and guts to take decisions. Let someone come [from the Congress and debate] with me on these issues. Poora khatam kar doonga [will finish them in the debate] because I know what all they have done. This is their common strategy. Once they go out of power, they feel suffocated and they try all these chota mota [small things] so that their misdeeds are not exposed. The government is kept busy fighting them. Do you think you should have done more to expose the “misdeeds” of the Congress in the past one year?